We had the first SmartBots shareholders meeting today at SLCAPEX office. SmartBots creation history has been revealed, new product has been presented. The future plans and goals has been revealed as well. The full meeting report is available in BOTS forum at SLCAPEX. Feel free to comment or ask questions! Remember you can buy SL BOTS shares at SLCAPEX at any time. We have a nice video explaining how to create account and buy shares. This page also describes the benefits for customers buying BOTS shares. Dear customers! Thank you for managing your business with SmartBots! We really appreciate your choice and promise to provide more and more services for you! 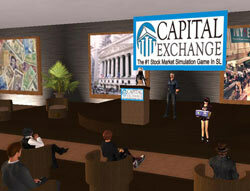 As you may know, SmartBots is a public company now, and you can buy SmartBots shares at SLCAPEX. Taking into account that BOTS shares price increases (10% more now), we would like to offer you to buy your very own part of SmartBots. To make this purchase more pleasing, we have a personal bonuses for customers buying SmartBots shares. This page explains the bonus structure we currently offer, along with how-to videos. You can buy BOTS shares right now. If you need any help, please contact Glaznah Gassner (the CEO) or Calgacus Swords (Senior Support manager) for details. SmartBots IPO (Initial Public Offering of company’s shares) has been launched at SLCAPEX marketplace 3 hours ago. 50% of shares are sold already! As CEO of SmartBots, I would like SmartBots customers to become shareholders (the share price is just L$1 during IPO). This will help us to establish the tight collaboration, and you will benefit from SmartBots development. Teleport to SmartBots office and create your SLCAPEX account: just pay L$1 to the SLCAPEX terminal (it will be added to your SLCAPEX balance).